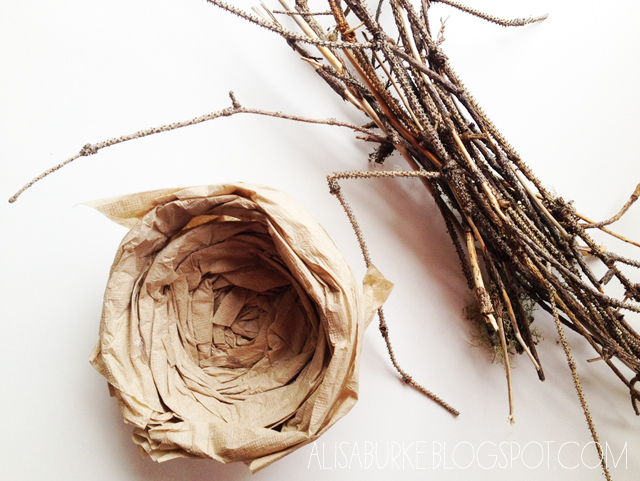 I started by twisting brown paper napkins and wrapping them around a bowl (this bowl will serve as a form for the nest). 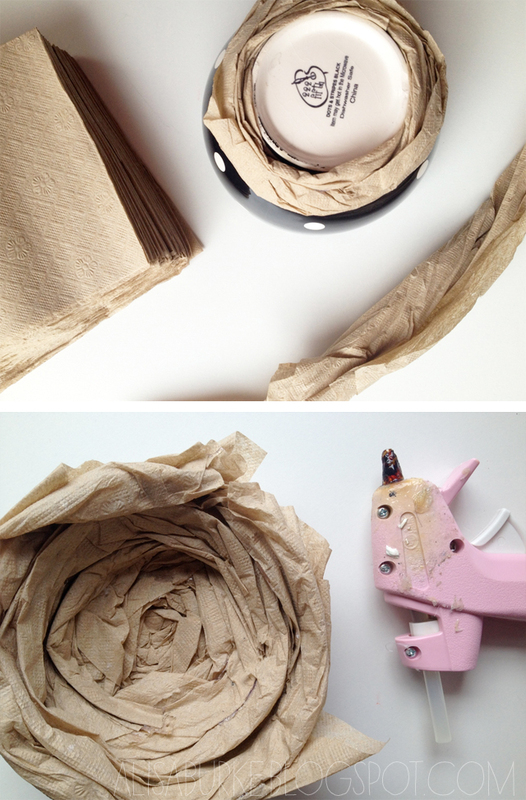 Using hot glue I attached the napkins to each other (do not glue to the bowl)by stacking and gluing as I went until I formed a nest. 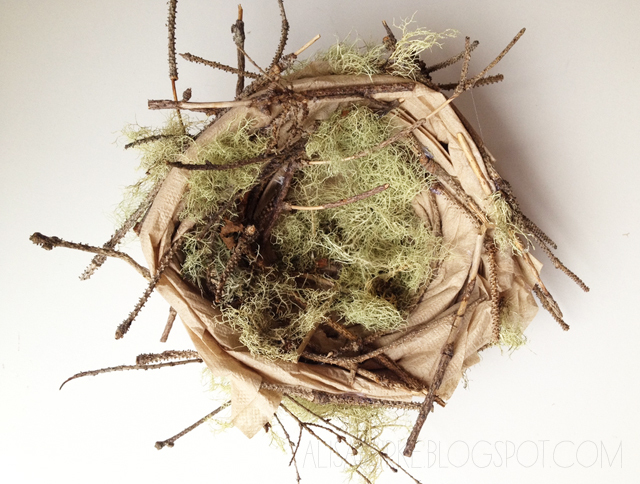 I collected twigs and moss and glue them to the surface of the napkin nest. Next, I used watercolors to add some shading and contrast the the napkins. 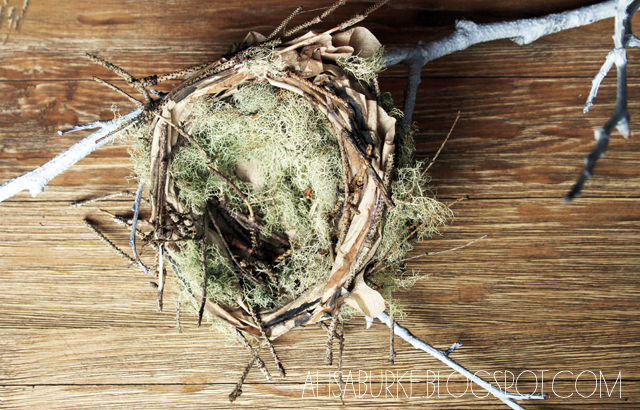 I will be using my nest as a centerpiece for the table so I found a long branch that I painted white and then tucked my nest into the branch. 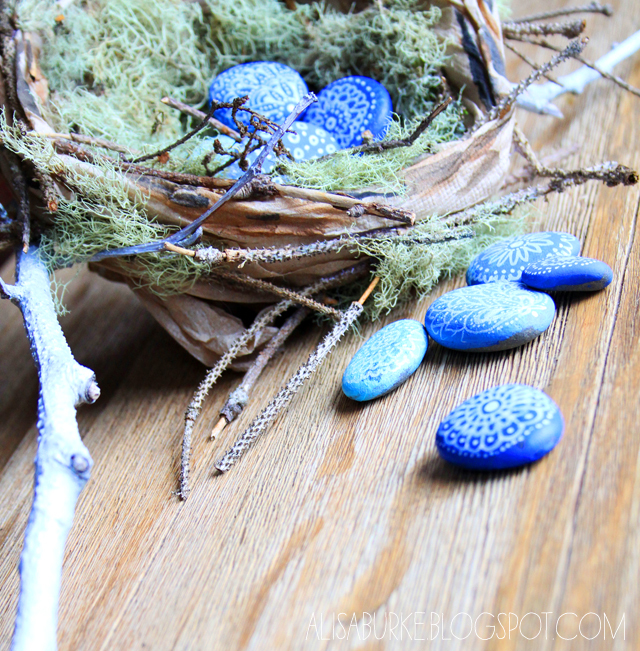 Last, I filled the nest with pretty blue painted stones. 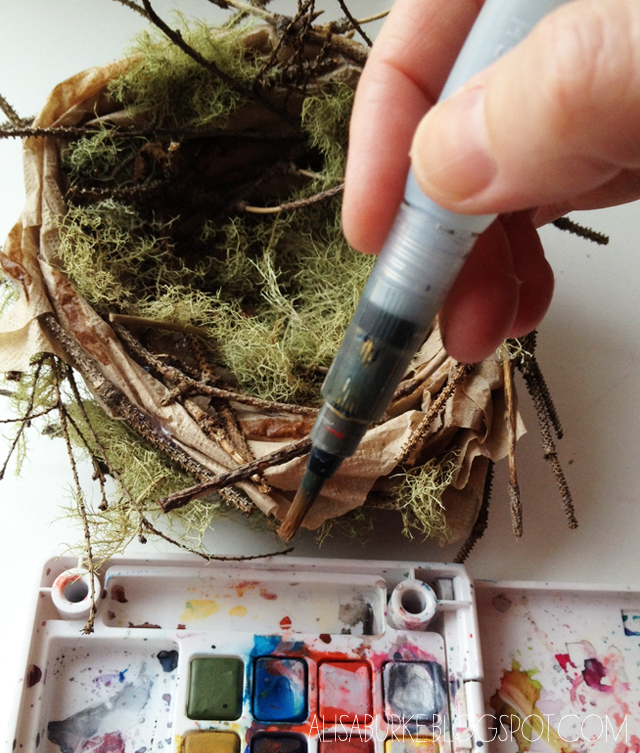 The result is a pretty little nest perfect for spring! Totally gorgeous!!!. The birds would be green with envy :). LOVE everything about it, the blue color against the mossy green, just perfect. This is one of the neatest ideas I've seen! 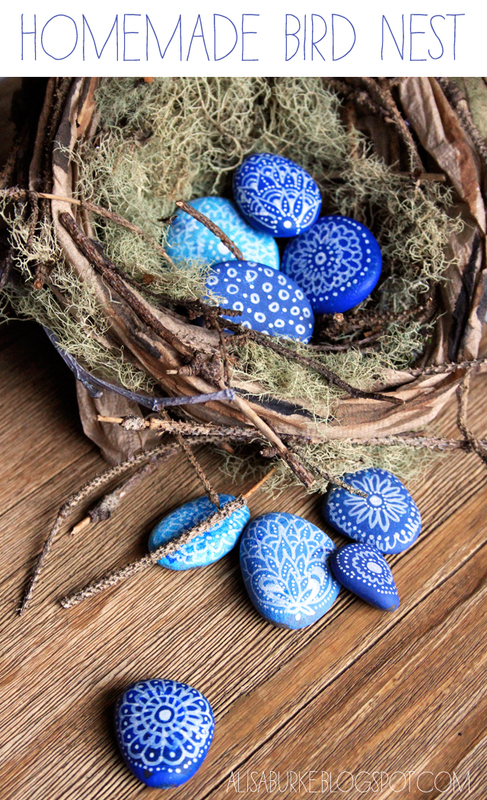 I love the nest and the stones are beautiful! I've been looking for a white pen that would work and I recently bought the Sharpie. I've followed the directions for using it but the paint either doesn't come out or comes out in puddles. Any suggestions? I love this idea. I have in the past found bird nests and kept a few, I would put them on the Christmas Tree or use as decoration but they tend to fall apart and there is always the question - what about bugs!! So I will definitely try this. Thanks Alisa. Love the simplicity of the design plus the use of all the natural elements and colors. I love this! The whole thing is great. I love everything about this Alisa!! The bird's nest looks beautiful!!! I fell totally in love with it! 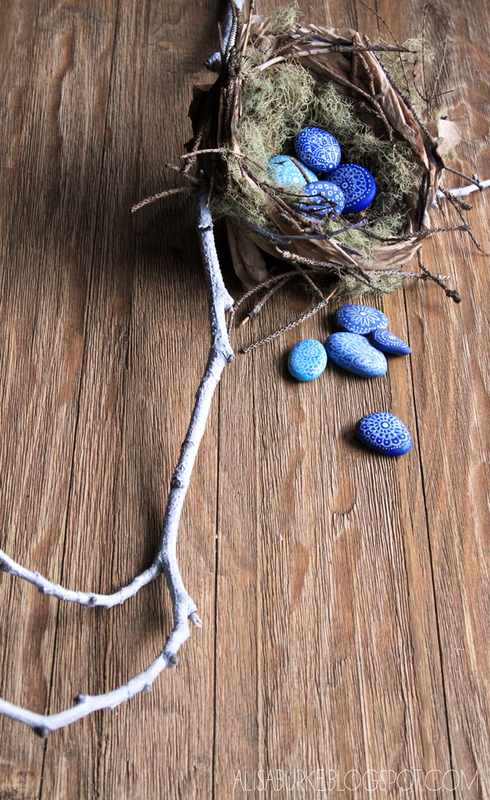 How cute this idea is, LOVE LOVE the blue stones. 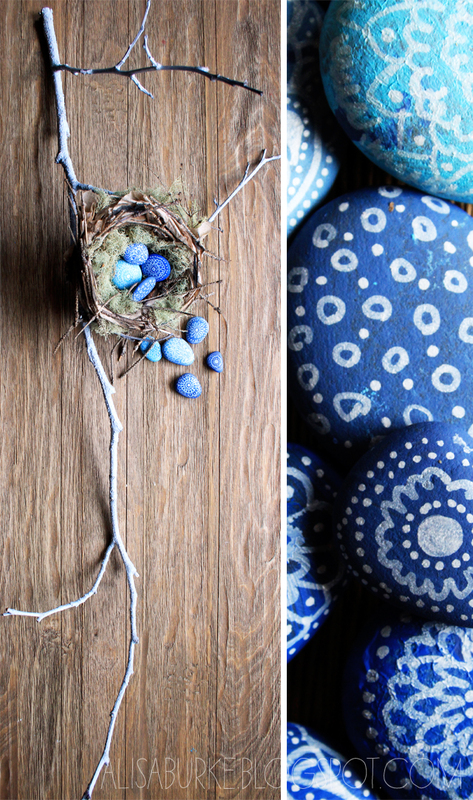 Thanks for sharing all these fun spring/easter egg ideas. Enjoying them all! So cute! Love the idea of repurposing those paint chips. Obviously meant that comment for an earlier post...sorry-o. Love these little birds nests too. I love this. I'll try to make the nest too and then fill it with the eggs from our farm that my MIL is dying with onion skins, turmeric and beets for Easter. Perfect for our centerpiece. I absolutely love this!!! I will give this a try!